Home DNA tests are insanely popular right now. If you stop to really think about it, it’s pretty incredible that you can swab yourself in the comfort of your own home and have the results of an extensive DNA test in your hands a short while later. People love these tests, and now is the perfect time to see what all the fuss is about. 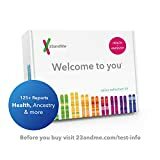 Amazon has a great sale running on the 23andMe DNA Test – Health + Ancestry Personal Genetic Service, which gets you more than 75 personalized genetic reports. It’s on sale right now at a $40 discount, but there’s a good chance it’s going to sell out soon so grab one while you can.